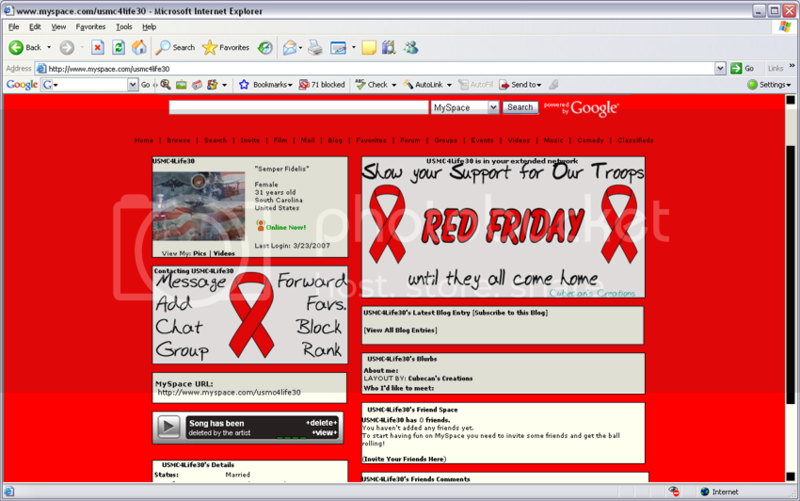 Welcome to our free Red Friday graphics and layout section. These layouts, graphics, and icons are for your PERSONAL USE ONLY. These graphics and layouts can not be used for commercial purposes. Several of these graphics are smaller images of the military designs in our shop. If you would like a design from the shop as a graphic and you don't see it, please send us an email and we'll gladly add it to the collection! All of these designs are our original creations and we work hard on each and every one. Do Not claim any of them as your own creation. Do not alter them in any way! We retain the copyright to these graphics and layouts but we are allowing you to use them for your PERSONAL USE ONLY for free. Visit our Myspace layout page for even more graphics, and myspace layouts! Thanks for visiting Cubecan's Creations. I hope you enjoy looking around! Come back often to see what is new! 1. Copy the code in the box under the layout that you want and paste it in the about me section of your myspace profile. 2. If you would like to save these files on your own account... after you have added the code to your site ... right click the following images and save them to your own photobucket account then replace the url location for the 3 images with your url location. The 3 images are the background, contact and the header image. We have designs for the Marine Corps, Air Force, Coast Guard, National Guard, Navy, and Army. So if you are looking for something to show your pride you have come to the right place. No matter what branch... USMC, USAF, USCG, USA, USN ... active duty or reserves we have something for everyone from the member themselves to the wife or husband the mom and dad and the kids too. No matter what the relationship aunt, uncle, niece nephew, grandparent, girlfriend, fiancee and more. You will find a wide variety of designs on a large selection of products including: t-shirts, sweatshirts, hoodies, onsies, thongs, boxers, buttons, coffee mugs, steins, magnets, yard signs, cards and much more. So look around and see if you can't find a design that is just right for you or to give as a gift. If you have a loved one deployed to Iraq or anywhere be sure to visit our deployment section as well as our welcome home section. If they are coming home from Iraq you may be interested in the very popular If you thought Iraq was hot wait until tonight designs. We offer custom homecoming designs for no additional charge. Request your personalized design today to help you welcome home your loved one. So from bootcamp to everyday military life we have a huge selection of apparel and designs too. Marine wives check out our very popular Semper Fiesty Shirts they are a great way to let everyone know that you are always feisty! All Content Copyright © 2005 Cubecan's Creations - Candy Owens. All rights reserved. the web site nor does the author guarantee the accuracy of content in web sites that are linked to and referenced on this site.